Mike Cameron and Marta Nimlos, 2001 12th grade first place winner and daughter to Father of the Year, Dr. John Nimlos. Fathers inspire children to be the best of what they already are. Children inspire men to tap into their deepest and greatest potential. These two statements are true. Yet somehow, good and loving fathers are too often the invisible and unnoticed parent. It’s often hit or miss whether a man will have the tools or the inspiration to be the father he aspires to be. Sometimes fathers disconnected from their families don’t know how much their children need them - or looking through their pain - how much they need their children. This essay contest is a useful tool helping kids to talk, fathers and mothers to listen and our culture to begin to see how essential fathers are. It is also a catalyst promoting children’s thinking; for boys, thinking about the qualities they admire about fatherhood: for what we admire we often emulate. For girls, thinking about how much it means to have respect and admiration from the most important man in their life, father. This in turn helps them to know what to expect and require from a man when it becomes time to form a life partnership. 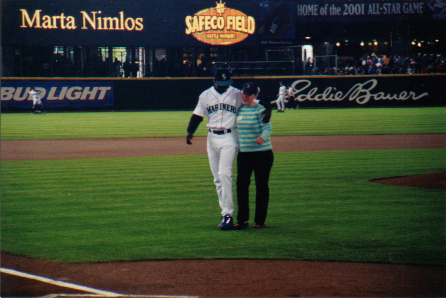 For the 2001 Seattle Mariners Father of the Year Essay Contest, FatherLove collected almost 2,500 essays; 2,500 testimonials to the profound necessity, of love, need and desire children have for the most important man in their life: a man who calls himself father. The words these children wrote -- words sometimes never spoken or heard before, create the potential to both let a father know he’s doing right - or that he’s not. And if he’s not, to let it be known that his absence hurts.